Thank you for visiting KM Thomas Designs! 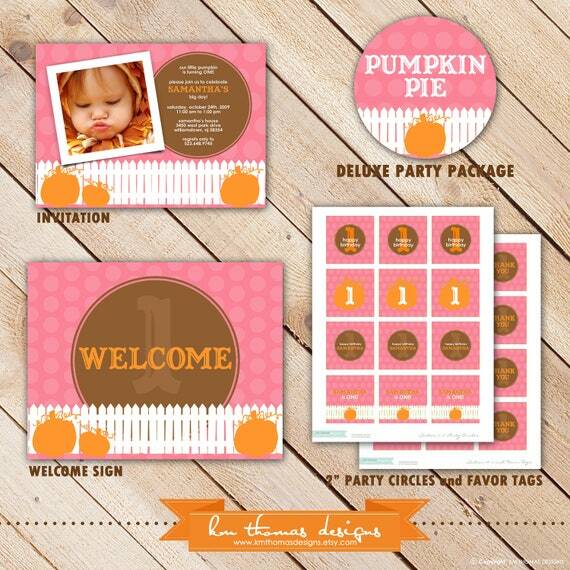 This listing is for our DELUXE Printable "Pumpkin Pie" Party Collection! You will receive all the .pdf files you need for the perfect coordinating birthday party! Basic crafting supplies are required for assembly. All pages are formatted to be printed on 8.5"x11" papers. PLEASE NOTE: This file is for personal use only. You may not forward, share, sell or distribute the file. It is for non-commercial use only. All Rights Reserved.